Clip in hair extensions are the most cost effective hair extensions available. Clip in hair extensions are also the least permanent of extension methods. A set of clip in hair extensions will usually include multiple strips of hair that are placed at different sections of the head. They are a great option if you are looking for more volume and length for a night on the town. We also carry halo extensions which are temporary and at a similar price point. Christina White Salon carries halo hair extensions. Halo hair extensions are similar to clip in extensions as they are temporary and cost a effective solution. Halo extensions sit on your head with a hidden wire that is covered by your own hair. 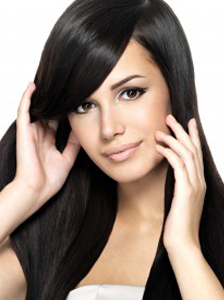 Halo extensions are just another temporary hair extension solution for you! Call us today to schedule a free, no obligation consultation at 314-380-4508.